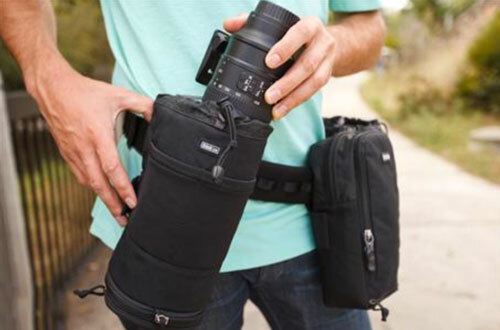 There are many companies providing photo gear, and some of them have unique items. It this review, I’ll look at three accessories from ThinkTank Photo. When you want to shoot an outside sporting event, you are most likely going to take a long lens with you. Outside events can happen on a sunny day, but eventually you’ll get rain one of those days. If you ever had to take pictures in a rainy environment, even if you have a camera that is said to be waterproof (or sealed), you know you just can’t proceed without water protection. That is where an accessory such as the ThinkTank Photo Hydrophobia comes to help. 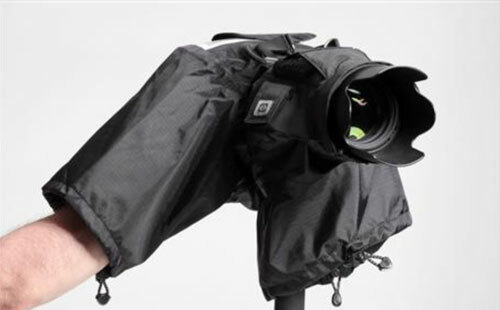 It covers your camera and lens with a protective rain cover, while letting you access the important controls on your camera. The Hydrophobia straps on the lens hood on one side, and attaches to the eye piece with a ThinkTank Photo eye piece that fits your camera. Installing it the first time proved to be a little challenging, but once installed, it worked as expected. A hole on the bottom-right helps you to enter your hand to reach the shutter button. On the bottom-left, another hole helps you reach the lens ring. This product can also be used with a tripod or monopod. The back is made of a transparent plastic so you can see your camera screen. There is also a little flap that attaches with velcro to protect the eye piece when not shooting. There is a handy shower cap, on a front pocket, to protect the lens hood if required. Inside the Hydrophobia, near the camera strap, an elastic band helps keep the strap out of the way. The Hydrophobia has its own strap attached to it, that can be replaced by your own choice if required. When not in use, there is a small pocket on the side of the Hydrophobia to store the eye piece. I often head out to photograph not knowing exactly which lens or gear I may really need while out and about. Having a backpack or a shoulder bag with my gear in is not always doable, as it may interfere with my shooting. And I do not want to leave my bag unattended in a public place. ThinkTank Photo Modular Set with the Pro Speed Belt is a good way for having my stuff with me, with little to no interference with my photographic activity. 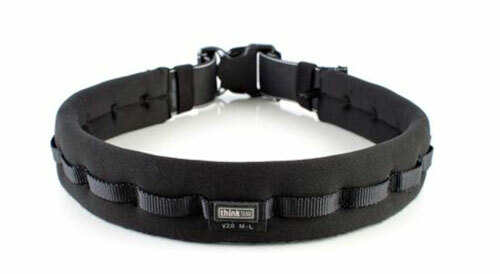 The Pro Speed Belt is almost two inches large and is really well padded for comfort. The belt clip is made of solid thick and durable plastic. The outside has a row of fabric sewn to form holes to insert the pouch tongue. The Modular Set is a collection of four pouches that attach to the Pro Speed Belt. Those pouches can be bought individually, but you get a better value by buying the set. In addition to the four provided in the set, ThinkTank Photo has a collection of other pouches you can buy separately. There is also a Skin Set available, which is mainly the same as the Modular Set, but the pouches have less padding. To get started, adjust and place the belt on your hip. Then detach the flap velcro of the pouch to reveal a plastic tongue in between the flap and the pouch. Place the plastic tongue in one of the fabric rings on the Pro Speed Belt with the flap behind the belt, and velcro it again to the pouch. This way, the pouch is solidly attached to the belt. When you need to access it, you can turn the belt around your hip to access each pouch easily. This is very simple design, but a very effective one. It takes little space, and yet you have everything you need at your fingertips. Each pouch has front pockets to accommodate smaller accessories, such as memory cards. They also have rain covers that can be extracted from a zipped section at the bottom. Almost two years ago, my amount of photo gear was growing, and a single bag or backpack could not handle everything. 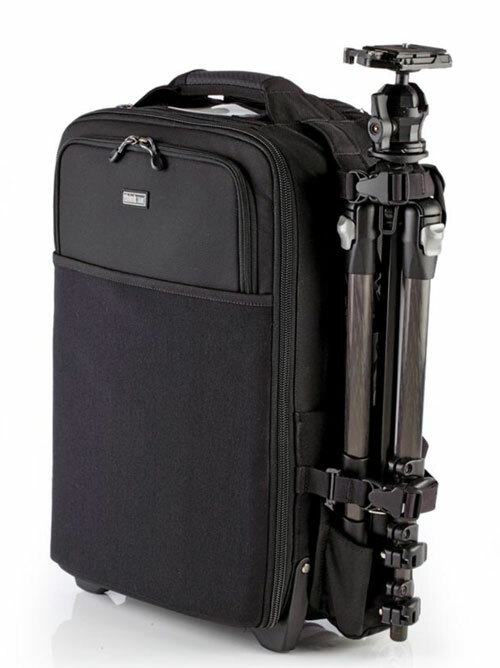 I bought an Airport Security V 2.0 Rolling Camera Bag from ThinkTank Photo to solve my problem. From there, it was not only a way for me to bring almost everything I needed for every circumstance, but it also became my main photo gear storage. 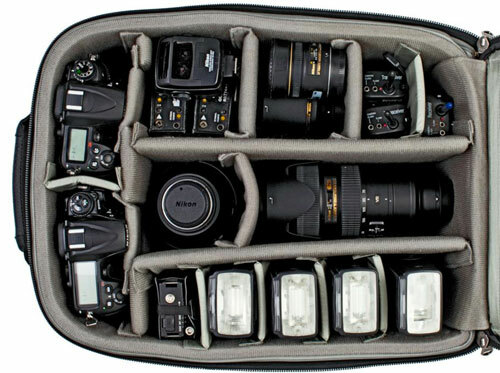 There are many rollers on the market, but I don’t think any do as much as the ThinkTank Photo rolling cases. For one thing, the wheels on this roller are of excellent quality that I’ve rarely seen in any traveling bag. The main compartment can be locked with the zipper hooks for secure storage. 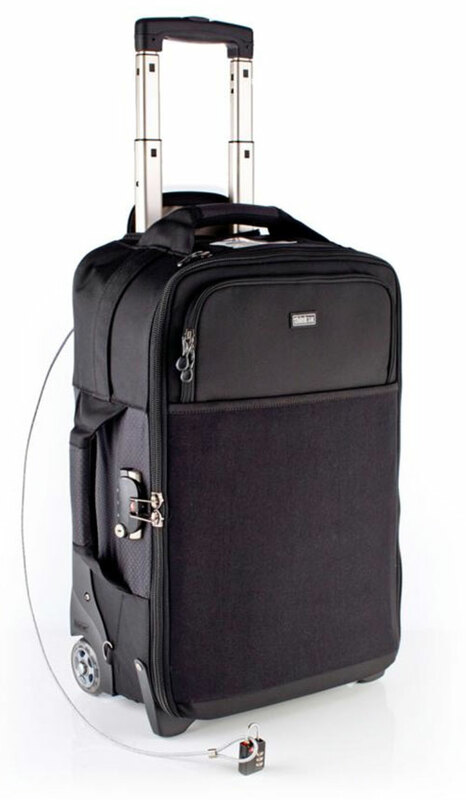 On the back of the roller, a metal wire with a lock is attached firmly to the frame, so it can secure the bag in a car trunk or an airport seat. The interior is highly customizable and comes with extra dividers. And for airplane travelers, this bag conforms with the International and USA domestic airline carry-on bag policy. It stores all my lenses (five of them, plus two lens extenders), can store two pro bodies, my three Speedlight flashes, my HDV camcorder, batteries and chargers, cables, memory cards, a small LED flashlight, and some of the smaller photo accessories I may need. Airport Security V 2.0 Rolling Camera Bag may not be perfect for everyone, but I really love it. My only complaint about it is that the main compartment door would be more usable if it was opening on the long side of the bag, instead of opening from the wheel side. When open, the door takes lot of space on the floor and is difficult to maintain open if leaning on a wall.